On to Halicarnassus, in the outer reaches of the Greek empire. 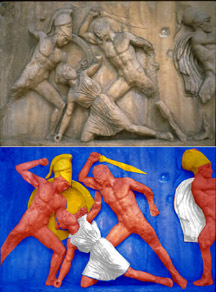 A frieze from the side of the tomb (above) and an example of how it would have appeared circa 350BC (below). The crusader castle with the friezes easily visible. The wonder of King Maussolus tomb was not so much in it’s size but in it’s hundreds of beautiful sculptures. Conceived of and possibly even started during his lifetime by his wife/sister Artemesia it was completed in BC 350, three years after his death. In some ways it was a very different wonder than so many of the religious structures on the list. This was a tomb dedicated to one man and the decorative sculptures by Bryaxis, Leochares, Scopas, and Timotheus, were of people and animals rather than Greek gods. All four sides had continuing friezes depicting the mythical battle of the Amazons which was supposed to have been won by the King's ancestors. The structure was rectangular in plan, with base dimensions of about 40 m (120 ft) by 30 m (100 ft). Overlying the foundation was a stepped podium which sides were decorated with statues. The burial chamber and the sarcophagus of white alabaster decorated with gold were located on the podium and surrounded by Ionic columns. The colonnade supported a pyramid roof. On top of this whole structure was a statue of a chariot pulled by four horses (known as a quadriga). The total height of the Mausoleum was 45 m (140 ft). This is broken down into 20 m (60 ft) for the stepped podium, 12 m (38 ft) for the colonnade, 7 m (22 ft) for the pyramid, and 6 m (20 ft) for the chariot statue at the top. The Mausoleum stood for some 1600 years with only light damage from earthquakes. 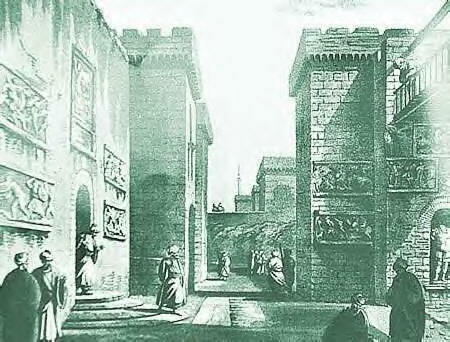 In the early 15th century the Knights of St. John of Malta invaded the area and constructed a large castle. To fortify their castle they used much of the stone from the Mausoleum. Because they liked the friezes the knights placed them in prominent spots inside the walls of the castle. The castle itself still stands with much of the stonework remaining but the friezes were taken to the British Museum in London along with most of the surviving statues. The friezes are bare marble today but when they stood in the walls of the mausoleum they were painted. The backgrounds were blue while the figures were painted red with gold clothing and brass weapons. Many archeological excavations have been undertaken at the site of the Mausoleum and together with the descriptions of the ancient historians give us a fairly clear picture of the tomb’s appearance. Many scale model recreations have been undertaken and are displayed in museums today. 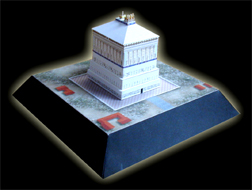 Our model is designed to give an idea of the all over appearance of the great monument but can not do justice to the amazing sculpture work that gave this tomb a place among the Seven Wonders of The Ancient World. This model has some small difficult parts .